With our DIY Combos, you can create the perfect look for your wedding or special event at a savings of 5%! With each of these combos, you'll get enough flowers for you to recreate the bouquet(s) pictured or design your own. Visit our Supplies section to purchase vases, floral tape and the other supplies that you might need to finish your design. Need a little help? You can arrange a little 'one on one' time with one of our experts. As with all wholesale flowers, you will need to process, hydrate and condition your flowers prior to use. 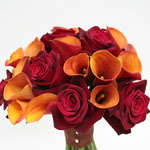 Please visit our 'Caring for your wholesale flowers' page for further information. 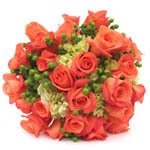 We've started with bridal flowers and will soon add event packages. Elegant white roses and mini green hydrangeas are featured in this beautiful DIY combo. ⇒ This DIY combo has seasonal availability! Save 5% by ordering this combo! 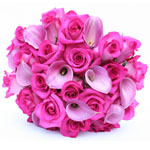 With this DIY Combo you select both rose and calla lily colors. 25 roses in your choice of colors. With this DIY Combo you choose your own rose color. 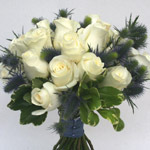 White roses and eryngium ringed with variegated pittosporum foliage are used in this stunningly simple DIY combo. 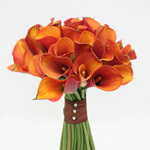 With this DIY Combo you get 30 stunning callas in your choice of colors. 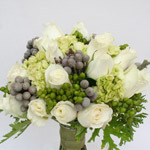 Perfect for you to make an elegant bouquet. Want something a bit fuller? You can add another 10 callas!